During the previous seven-day report period (May 17-23, 2013), natural gas on the New York Mercantile Exchange (NYMEX) rose 6.6%, and the average price for peak power on the PJM rose 5%. However, for this current report period we saw a role reversal. Last week, the average 12-month price for natural gas on the NYMEX fell 5.3% and the 12-month average price for peak power on the PJM fell 4%. 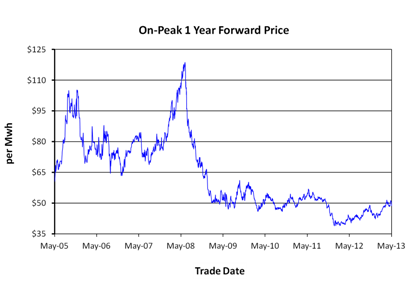 Natural gas and electricity are two of the most price-volatile commodities traded in the world. Many variables impact pricing. However, it seems that weather has been the most dominant variable during the past two weeks. For example, energy prices rose during May17-23 after the National Oceanic and Atmospheric Administration (NOAA) predicted hotter-than-normal temperatures east of the Mississippi in their 6-10 day forecast. Then, energy prices fell at the end of last week as forecasters called for more moderate temperatures. If you can predict the weather you may have a shot at predicting the direction of energy prices. Another variable worth watching is the natural gas storage position. The U.S. Energy Information Administration (EIA) releases the natural storage report every Thursday at 10:30 a.m. Last week, gas inventories were 4% below the five-year average. It is important to note that last year at this time we had a huge gas surplus in storage. On May 25, 2012 storages were 34% above the five-year average. In order to keep a lid on energy prices this summer we need to keep the natural gas injection numbers near triple digits. If the weather is hotter than normal, and natural gas is pumped to the power plants instead of to the storage fields, the current storage deficit will be tough to erase. Energy prices may try to rise above today's levels. However, the good news for now is that both natural gas and electricity prices are trading near their second lowest level in nine years. This may be a favorable time to look at an early renewal strategy. Hurricane season starts on June 1st and summer officially starts June 21st. Storage Update: Although the natural gas injections in April 2013 were below average, the injections for May 2013 were much closer to normal. In this week's report we saw another solid injection of 88 Bcf. Last year at this time we saw an injection of 72 Bcf. The five-year average injection for this time period is 92 Bcf. Thus, the deficit of a year ago has continued to shrink. Unfortunately, the deficit, relative to the five-year average, was slightly worse. Gas inventories ended the week 23.7% below last year's levels and 4% below the five-year average. It is important to note that last year at this time we had a huge gas surplus in storage. On May 25, 2012, storages were 35% above the year-to-year number and 34% above the five-year average. In order to keep a lid on energy prices, we need to keep the gas injection numbers near triple digits. If natural gas is pumped to the power plants this summer instead of to the storage fields, this storage deficit will be tough to erase. Prices could try to rise above today's levels. Weekly Drilling Rig Update: The active U.S. gas rotary rig count for natural gas released by Baker and Hughes for the week ending May 24, 2013 was 354 rigs. This number of rigs remained the same from the previous week. The count is 240 rigs lower than the count reported this same week last year. We are 61% below the five-year average gas rig count of 919.